The Ancient Egyptian, men and women alike, are great lovers of jewelry and adorned themselves with a profusion of trinkets. These included a variety of jewelry including amulets, necklaces, pendants, bracelets, rings, head jewelry, anklets, diadems, collars, collarettes and insignia. Filigree work on Egyptian jewelry produced a delicate, lacelike gold or silver wire which was generally used in buckles and clasps of gold. Gold was the most common material used in creating Egyptian jewelry as it was easily available from Nubia but silver had to be imported from further away and was therefore more rare. 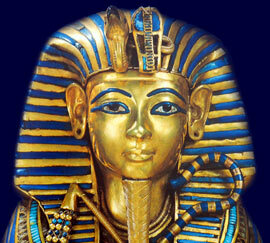 Egyptian jewelry was not just made for decorative purpose. It contained symbols that would provide the wearer, dead or alive, with protection and prosperity. Many items of jewelry took the form of amulets designed to ward off the evil eye and protect the wearer from evil forces both natural and supernatural. Lucky charm jewelry was fashioned in images of gods, magical signs, hieroglyphs and animals. The Egyptian Scarab Beetle was used as an amulet or a good luck charm by both the rich and the poor in Egypt. A depiction of a scarab beetle was used in the making of jewelry in the form of various types of pendants, bracelets, rings and necklaces. Scarab jewelry was believed to hold strong magical and religious properties. The name of the owner was inscribed on the flat base of the scarab to ensure that protective powers would be given to the wearer. Scarab pendants, bracelets, rings and necklaces were often made of precious or semi-precious jewels such as carnelian, lapis lazuli and turquoise. The colored glass favored by the Ancient Egyptians called Faience was also used to create such amulets. Faience was a strong greenish blue glass-like material, consisting of crushed quartz, lime and alkali. Not satisfied to adorn themselves when living they loaded the arms, the fingers, the neck, the ears, the brow, and the ankles of their dead with more or less costly ornaments. The quantity of jewelry buried in tombs was so considerable that even that of a minor king such as the boy King Tut was worth a king's ransom. Much of the funerary jewellery was made merely for show on the day of the funeral, and betrays its purpose by the slightness of the workmanship. The favourite jewels of the deceased person were, nevertheless, frequently buried with him, and the style and finish of these leave nothing to be desired. As in the eyes of her husband his ring was the one essential ornament, so was her necklace in the estimation of the Egyptian lady. Necklaces were produced in all sizes and patterns, some consisting of two or three twists, some of large links, some of small links, some massive and heavy whilst others were light and flexible . The humblest peasant girl, as well as the lady of highest rank, required a necklace. The style of Egyptian jewelry described as bracelets were produced in a variety of different types. Some bracelets were anklets and armlets which might consist of plain gold rings, both solid and hollow, bordered with plaited chainwork in imitation of filigree. Other bracelets were designed for wearing on the wrist, like the bracelets of modern ladies, and were made of small beads in gold, lapis lazuli, carnelian, and green felspar. These items of Egyptian jewelry were often strung on gold wire in a chequer pattern, each square divided diagonally in halves of different colours. The bracelets were fastened by means of a gold pin. The description of the jewelry found in the tomb belonging to Queen Ahhotep provides facts and information about the style of the ornate royal Egyptian jewelry. A beautiful bracelet was found on the wrist of the queen. The bracelet is made of solid gold and consists of three parallel bands set with turquoises. On the front a vulture is represented with outspread wings, the feathers composed of green enamel, lapis lazuli, and carnelian all set gold. The hair of the mummy of Queen Ahhotep was drawn through a massive gold diadem, scarcely as large as a bracelet decorated with blue paste upon an oblong plaque in the centre, flanked at each side by two little sphinxes. Round her neck was a large flexible gold chain, finished at each end by a goose's head reversed. These heads could be linked one in the other, when the chain needed to be fastened. The scarab pendant to this chain is incrusted upon the shoulder and wing-sheaths with blue glass faience rayed with gold, the legs and body being in solid gold. The royal jewelry was completed by a large collar known as the Ûsekh. This collar of Queen Aahhotep is finished at each end with a golden hawk's head inlaid with blue enamel, and consists of rows of scrolls, four-petalled fleurettes, hawks, vultures, winged birds, crouching jackals, and figures of antelopes pursued by tigers. Upon the breast, below this collar, hung a square jewel of the kind known as "pectoral ornaments".